As the latest in Swedish supercars, the Agera RS is the European version of the US-spec Agera XS. To be formally unveiled at the upcoming Salon Privé Concours in Oxfordshire, this Agera RS will arrive with several custom features. 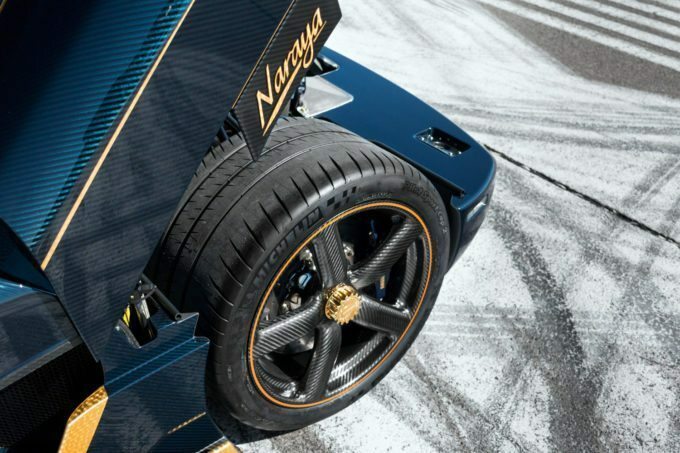 The owner has named the car ‘Naraya’, and it can be found emblazoned in gold on the rear quarter panels. Providing a brilliant contrast against the blue tinted carbon fiber, 24k gold leaf was applied by hand before being buried under several protective clear coats. To see that color combination to its fruition, the cockpit is the first example of a blue tinted carbon fiber monocoque. Blue alcantara and gold piping compliment an 18k nameplate. No less than 155 diamonds can be found on the plate, a testament to the unlimited abilities of their artists. For power befitting such luxury the Koenigsegg V8 has been tuned to 1160 hp and 944 lb-ft of torque. A seven speed dual clutch automatic sends power to an electronic differential equipped with their own stability and traction control systems. If you happen to be in England later this week, It will be on display alongside a blue tinted One:1, and Agera R at Blenheim Palace. Stay with us for the latest Koenigsegg news.